1969, a vintage year, and a vintage crossword from Dac. I found this about par for difficulty, though with a little doubt over both 18d and 19d where, though the wordplay was crystal clear, neither were familiar enough I felt 100% confident putting them in. Embarrassingly, no Welsh girl names leapt to mind when I needed to think of one for 13ac, and I reverse engineered the wordplay. COD? Lots to like as always, with 11ac my favourite – ‘Soldiers taking steps to safeguard Home Rule (9)’. Brought to you by the power of Tomos Watkin’s Magic Lagyr. I’d argue it helps, others might disagree. The puzzle. 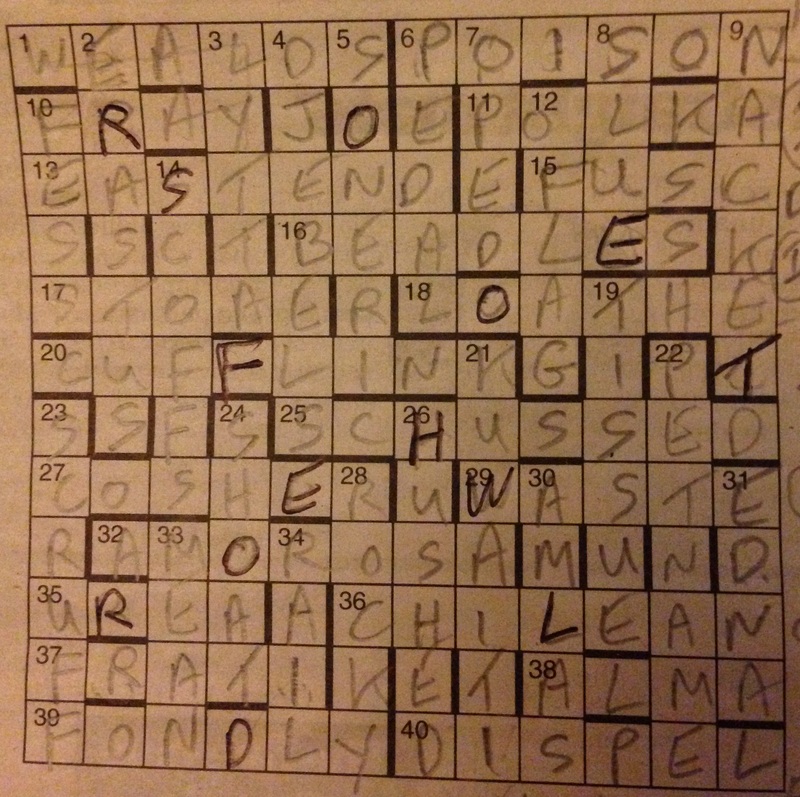 The second by Phi in this Saturday’s i, and first thoughts are – aren’t those clues printed in a small font? Presumably that means there’s lots of them to get through. Some entries jumbled, and don’t fill all the spaces, that’s a little worrying. Extra words in others giving definitions for the complete versions. Best get cracking then. A rare start before lunch on a Saturday, and quite a speedy one too, with clues that wouldn’t be out of place over in the cryptic. A few redundant words that are easy to spot, and a couple of those jumbled entries, starting with the fairly gently 15ac. A couple where the big red book is a must, and at the close some problems in the SE corner that’s resolutely blank because… Well, because I’ve got LIAR instead of RAIL and once that’s fallen, so does the rest. Along the way I’ve also made a stab at one of the “complete versions” of the jumbled clues, because it looks like nothing but CRETISM will fit at 1ac, TRIES jumbled in the centre of C & M. A lovely word, that apparently means lie, and one that should be revived. So to put those extra letters into a “logical order”. Alphabetical? Nope, that doesn’t help. Alphabetic by first letter in the pair, not that either. How about by clue number? Go with an A for 15ac, read down the columns, to give: CONTENT MAY VARY. Which fits the title. That’s good enough for me… A fairly gentle offering, but no less enjoyable for it. Until next time, when Schadenfreude deals a rude card. 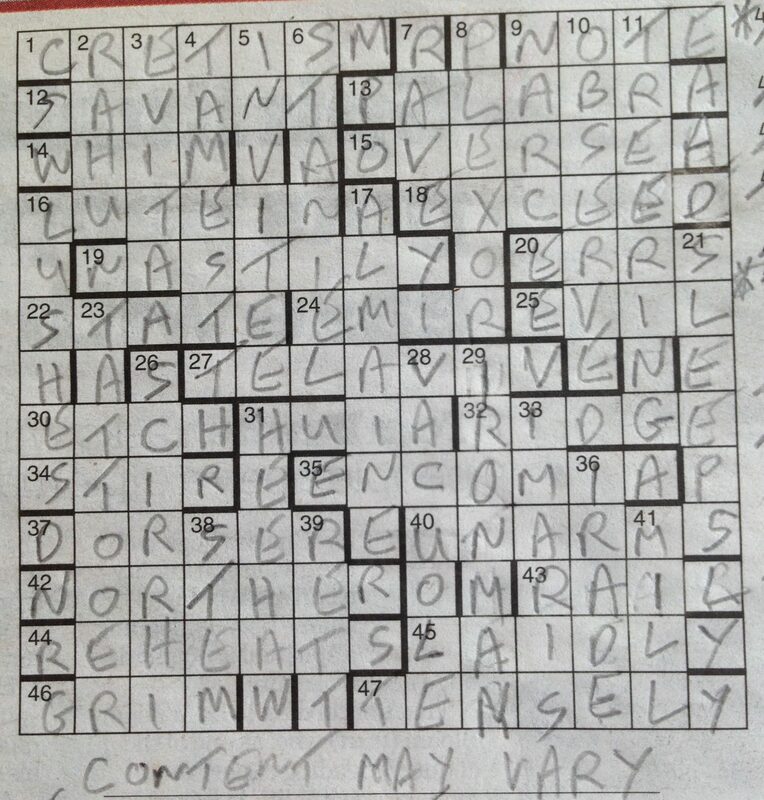 It seems to me that there’s a particular style of crossword which Eimi likes to serve up on a Tuesday: it’s rarely the hardest of the week but often the most entertaining. Small wonder therefore that Radian frequently takes the slot, witty puzzles with jiggery-pokery being something of a speciality. Today’s was littered with thematic material, a few red herrings and some amusing surfaces, and all told represented about as much fun as one can have sitting down with a newspaper and a ballpoint pen. I’d venture to suggest that this one should be right up Sprouthater’s street. I have plenty of ticks today and no complaints. When the puzzle first appeared back in February 2013 there was a bit of criticism for 24ac over at Fifteensquared, several curmudgeons taking the view that “man” should have a capital letter. Not if you’re conversant with John Donne, is what I think, and at any rate it’s hardly a “criminal offence”. Ho hum. Do pay them a visit though – comment 11 is snortworthy. Nothing too difficult today I thought. 3d and 18ac might be unfamiliar to many solvers (and the former certainly was to me), but perfectly gettable with a little thought. I had question marks beside 9d and 15d, but both are explained in the blog and comments over on the other side. So to the rest of a good old fashioned slightly damp, misty Bank Holiday. COD? 1d – ‘Bird getting damaged with its wings twisted (6)’. Over at Fifteensquared with all the answers here there was unanimous applause for last Saturday’s puzzle, so it must have been just me in a grumpy mood then! Not with the tui, dreck, spelunker or lorikeet– all fine with me (hasn’t everyone heard of a lorikeet?) – but I didn’t like ‘stick’ being in both anagram fodder and solution for 2d, and I found all that tope business in 7d completely inaccessible. Then the definitions for 18a, 3d, 17d and 19d all jarred, alas… But everyone else seems happy with them, so maybe it was just me! Heigh-ho. I did finish it in reasonable time and thought there was probably something ‘going on’. It turns out that The Father Brown (23a) series of detective stories includes: Innocence (16d) Wisdom (1a) Incredulity (11a) Secret (26a) and Scandal (20a). A fairly light offering today from Alchemi that didn’t take too much time overall, though I did come badly unstuck at the end on 21d and across which seemed to come from a much harder puzzle altogether. No theme or Nina, despite suspicions when first 4ac and then 23ac appeared in quick succession. For the most part pretty workmanlike and in good order, there were also more than a few that sparkled, COD for me going to 14d – ‘Despicable people caught in lies about where to dig for ore (6,4)’. It’s mid-week, it’s Dac, and a puzzle that’s as well put together and enjoyable as ever. On the easy side, with a couple of new words learnt via wordplay that left little doubt as to the outcome. We were talking on Monday about crosswords that are suitable for new (and newish) solvers – well, here’s another good one. COD? Amongst lots to like, my favourite was 2d – ‘Play Oasis hit? No, don’t! (4,4,2,5)’. A game of hide and seek, and a title that… well, that could mean anything. 🙂 eXternal, who’s beaten me two times out of three in the Inquisitor. Yikes. Today misprinted definitions to give us the hider and seeker, letters omitted from the wordplay of others the quarry. The endgame a maze. Lots to think about, so perhaps that’s why, following a promising start with 1ac and 6ac falling quickly… nothing else for an embarrassingly long time. Hungover? Tired? No, just a misread preamble, failing to notice that letters are omitted from the wordplay, not that we have to omit them. At which point the grid begins to fill, but… Eurovision, and a busy weekend, and it’s a full two days before I get a chance to move beyond the three quarters full grid. Perhaps the endgame will help. The misprinted definitions first, because that’s easier, the corrections giving us: Henry II and Eleanor. Hurrah. To the letters omitted from the wordplay, which have to be read “top to bottom and left to right.” A painstaking copy of the grid into Excel – because I’m really not that confident I haven’t messed something up – and highlight the letters there, albeit with some doubt over the final R (no, I still can’t work out what the pipsqueak in 35ac might be). Do they look sensible? Yes they do – Rose Of The World – presumably Rosamund Clifford, Henry’s mistress. The omitted letters forming bars, we’re to follow “the shortest route from top left to the start cell of the quarry”, and there she is in the grid, ROSAMUN?, giving us EDNA for 31d, where I can see wordplay now, but why in the world is Edna “delightful”? The traditional story recounts that King Henry adopted her as his mistress. To conceal his illicit amours from his Queen, Eleanor of Aquitaine, he conducted them within the innermost recesses of a complicated maze which he caused to be made in his park at Woodstock, Oxfordshire. Rumours having reached the ears of Queen Eleanor, the indignant lady contrived to penetrate the labyrinth, confronted her terrified and tearful rival, and forced her to choose between the dagger and the bowl of poison; Rosamund chose the latter and died. 6ac is DAGGER, so I think I can guess what we’re going to have to change in the final grid, but let’s check. Pick the odd letters from the top left along that shortest route to the ill fated mistress to give us: Way To Forfair. Forfair – “to perish or decay”. Change 6ac to POISON, and we’re done, I think, and learnt something along the way. Fingers crossed, that’s evened things up a bit with eXternal, and a very fine contest it was too. Until next week when the i serves up Phi, Phi, and more Phi. Punk is amongst my favourite setters because he clearly sets out to entertain and amuse as much as to bamboozle and baffle. There’ll always be a few chuckles in there, and so it proved today. However, you just can’t please some people, and it seems that back in December 2012 a number of the Fifteensquared regulars had fallen out of bed on the grumpy side.